Uncle Bill's Pet Centers. Cobalt Fry Minis - 1.2 oz. Cobalt Fry Minis - 1.2 oz. At Uncle Bill’s Pet Center, we not only offer Cobalt fish food for sale, we also employ a highly trained staff that can assist you in finding an appropriate formula. 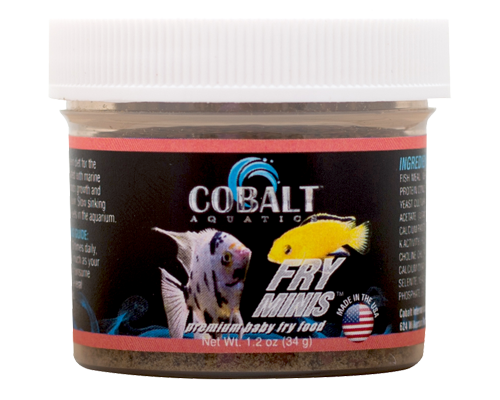 Cobalt Fry Mini's are a complete high protein diet for the important first stages of a fry's life. Formulated with marine protein, vitamins, and minerals for proper body growth and development. Plus carotenoids for added color! Slow sinking pellets allow fish to feed at all levels in the aquarium. We will be glad to work with you to ensure that you feed your fish quality food for optimal health and happiness by providing the best selection and value on premium aquarium food for sale in Indiana. Fish Meal, Wheat Flour, Blood Meal, Poultry By-Product Meal, Fish Oil, Soy Protein Concentrate, Grain Distillers Dried Yeast, Soy Lecithin, Astaxanthin, Yeast Culture, Vitamin A Acetate, Vitamin D3 Supplement, dl-Alpha Tocopheryl Acetate (Vitamin E Supplement), Vitamin B12 Supplement, Riboflavin, Niacin, Calcium Pantothenate, Menadione Sodium Bisulfite Complex (source of Vitamin K Activity), Folic Acid, Thiamine Mononitrate, Pyridoxine Hydrochloride, Biotin, Choline Chloride, Manganese Proteinate, Zinc Proteinate, Copper Proteinate, Calcium Iodate, Iron Proteinate, Cobalt Proteinate, Calcium Carbonate, Sodium Selenite, Yeast Extract, Calcium Propionate (Preservative), L-Ascorbyl-2-Polyphosphate (source of Vitamin C).